After welcoming Tanner Kimbler back to the lineup, Green is 4-1 in its last five contests. FRANKLIN FURNACE — Tayte Carver’s answer to coach Dirk Hollar’s question was a short one … but it spoke volumes. The two were, of course, talking about Tanner Kimbler returning to Green’s lineup after suffering a leg injury earlier in the season. Kimbler looked as if he hadn’t missed a beat, dropping 28 points alongside five rebounds and five assists. The Bobcats entered that contest at 5-5. Currently, they’re 9-6 overall. You do the math. During his absence, Kimbler didn’t discount his time off. While working to get back, the senior also realized how much he enjoyed the little things. Kimbler’s injury took place during the second game of the season at Rock Hill. It may not have been your run-of-the-mill gruesome injury, but it certainly could’ve been. Kimbler then went through three weeks of physical therapy and ceased all basketball activities until he was at full strength. Even though Kimbler wasn’t even gone a month, his absence was certainly felt. 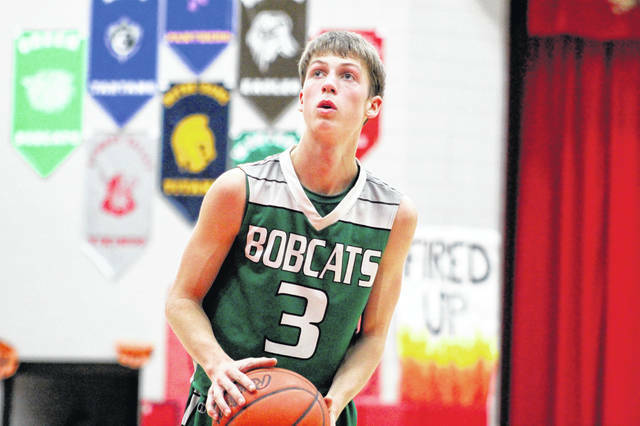 The Bobcats, who usually boast of a fast-paced offense and rely on transition points, had to find new ways to score. Needless to say, at times, they struggled. ‘Frickin’ no man’s land’ is an accurate depiction of where Kimbler sometimes spots up. Since his return, Kimbler has posted scoring totals of 28, 13, six, 32 and 22 points alongside 14 3-point field goals. While he’s far from selfish with the ball in his hands, he’ll be the first to tell you that shooting is what he likes to do best. His teammates are certainly appreciative of the work he puts in when nobody’s looking. But that bond reciprocates through Kimbler as well. The senior says him and his teammates have a tight bond on and off the floor, which is a trademark of any team’s success. With Kimbler back, hopefully for good, his squad looks to have its swagger back. Because of that, they sky’s the limit.